Less than 1 percent of the ancient Caledonian forest remains, much of it in the Abernethy region, where Rachel and I camped for a week in mid July. 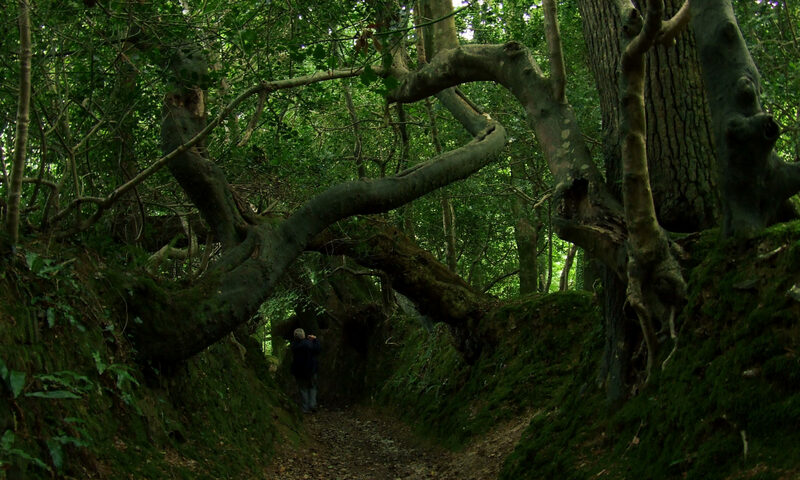 She wanted to prove to me that real forests still existed in the British Isles. Our first evening there, I went for a walk and discovered this dead sheep. It was on the edge of a rather unique, elfin woodland some 30 acres in extent that consisted almost entirely of junipers. In the moor surrounding the junipers, I found more remains of what I took to be sheep. Things were certainly beginning to look up. and the hare bells glowed in the setting sun. that festooned juniper and birch limbs alike. Whole trunks were covered with fruticose lichens, making us think that some of these trees must be a lot older than their small size might otherwise suggest. and the rivers were low. A public footpath along the Nethy River as it passed through the village was lined with eco-art projects of varying quality. A few of them, like this macrame creation, were really well done. One day, we took a walk over to the famous Osprey Centre at Loch Garten, now the center of a large nature reserve owned and managed by the RSPB. This year’s birds had just fledged and were still hanging around the nest. The center was well equipped with binoculars, spotting scopes, and video screens displaying the feeds from nest cams. I was impressed not only by the set-up but by the whole approach to conservation there: using a few charismatic species to build support for preserving and recovering an endangered ecosystem. Another such species is the capercaille, which we weren’t fortunate enough to see — this chainsaw sculpture outside the Osprey Centre was as close as we got. Though most stands of Scots pine — the dominant tree — didn’t appear to be more than a century old, there was a generous scattering of older trees among them. This sort of open forest with a groundcover of bilberries (which are very like our lowbush blueberries and huckleberries) was perfect habitat for capercaillies, as we learned in a lecture by the RSPB’s capercaillie specialist a few days later. The trouble is that the remaining habitat is too fragmented by development. And sadly, the designation of the surrounding area as Cairngorms National Park ten years ago has only accelerated the pace of development. It’s a park in name only, created mainly for tourists rather than for wildlife. The RSPB is doing an impressive job of preserving land, but they can only do so much. It’s sad that the country that gave us John Muir doesn’t seem to understand the value of wildness. Between deer overbrowsing, habitat fragmentation, and invasive species (above, Norway spruce), I felt right at home. It was fun to watch the native red squirrels — now so threatened by invasive American gray squirrels in the U.K. that people actually put out feeders for them. But I don’t mean to accentuate the negative. We had a wonderful time, and one week was barely enough time to get the lay of the land, figure out the extensive trail system, and make a few friends. I hope we get to go back there some day. Thanks for this window into that part of the world, Dave. These are lovely. I don’t know enough about different kinds of squirrels. Where I grew up, in Texas, the squirrels were grey. Here in the Berkshires I see mostly red ones. I wonder whether they’re the same as the English ones? Yeah, sorry, I should’ve put in a link (rectified now). Different genus altogether. Beautiful animals, and a bit larger than our reds. More info about national parks in Scotland in general (and John Muir in particular) in this opinion piece which demonstrates another aspect of the highly political issues under discussion.